With its emphasis on altered consciousness, shamanism—communication with the spirit world—offers archetypal visionary insight concerning the nature of the psyche; it has much in common with the key Jungian notion of individuation or fully developed and integrated consciousness. Jazz has much in common with shamanic experience. The pan-tonal and pan-rhythmic music of the Norwegian saxophonist and composer Jan Garbarek exemplifies the healing presence of the shamanic, or individuated, spirit in 20th-century music. This according to “The body electric: The shamanic spirit in twentieth century music” by Michael Tucker, an essay included in Music and mysticism, two consecutive issues of Contemporary music review (XIV/1–2 and 3–4) dedicated to the memory of Philip Rawson. 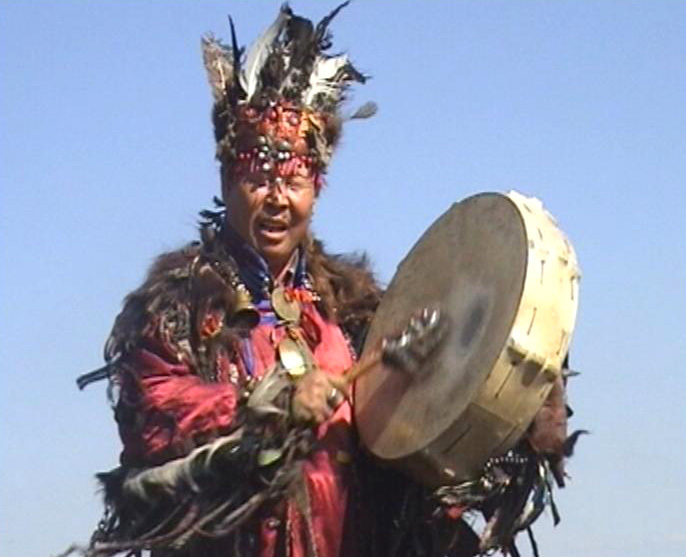 Above, a shaman from the Altaj Mountains of Central Asia. Below, Rahsaan Roland Kirk’s I talk with the spirits.